Theme 1.“Jubilee” (“Molla Nasreddin” Cartoon Contest is 10 years old). 2.“Jubilee” (I’m 50 years old). Azerbaijan Cartoonists’ Union announces “Molla Nasreddin” - Azerbaijan - 2018” International Cartoon Contest. 2018 - is the year of the 10th anniversary of the “Molla Nasreddin”- Azerbaijan” International Cartoon Contest. On this occasion the theme of the “Molla Nasreddin” International Cartoon Contest organized in 2018 is “Jubilee”. 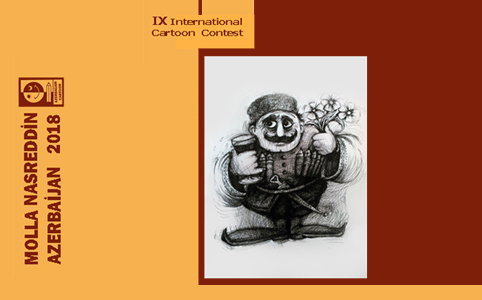 The IX International Cartoon Contest is held by the support of Azerbaijan Republic Ministry of Culture and Tourism, Azerbaijan Artists’ Union and Federation of Cartoonists Organizations.